I love Yeo's products. I sent them an email address and some years later learned that hackers had stolen it and a password. This is unduly annoying. I continue to buy their products but never had as much as a "So Sorry" from them. If I had it to do over, I would not give them any information about myself. 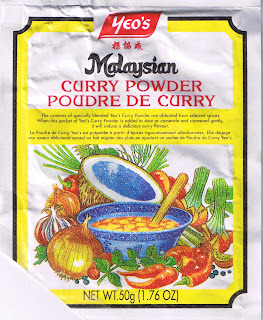 Yeo's Malaysian Curry is different. Not that I've sampled a decent 1000 or so curries, I haven't. But I have collected or read a few hundred curry powder recipes and having seen the differences and similarities of them, I reiterate: Yeo's is different. It's ingredients, as listed on the package are no different than many ingredients common to all curry powders, yet, it is different. I write about this, as it is one of the recurring recipes I like to make. Especially in cooler weather. Beer would be better with this dish than wine. Heat the oil in a 3 quart pot, about 5 minutes. In the meanwhile, slice the onions. When sliced, add them to the hot oil. Raise heat to medium and stir to break the onion into slices about 30 seconds. In the meanwhile, cube the chicken into 1/2" to 3/4" pieces. When the onions start to brown, after 8 to 10 minutes, add the curry powder and stir to incorporate. Add the salt, stir once or twice. Add the chicken, potatoes and then the coconut milk and water to barely cover. Bring to a boil, lower the heat to the lowest simmer. Cover and simmer 25 minutes longer. Serve with plain rice and lime wedges. Coconut milk or (sometimes called) coconut cream is somewhat thick. It is not coconut water. It comes in cans of 14 or 15 ozs. Use the whole can and add enough water to barely cover the meat and potatoes. 50 grams of Yeo's cost $1.25 (US $) in Nov. 2012.